36" circumference and 19" wide. 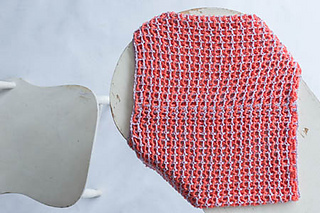 Clever crocheted colorplay yields a fabric that looks woven. This stylish cowl can be worn in a range of options— scrunched up at the neck, over your head, or in a tube around your shoulders. GAUGE 4 reps = 41/4” in double mesh patt.